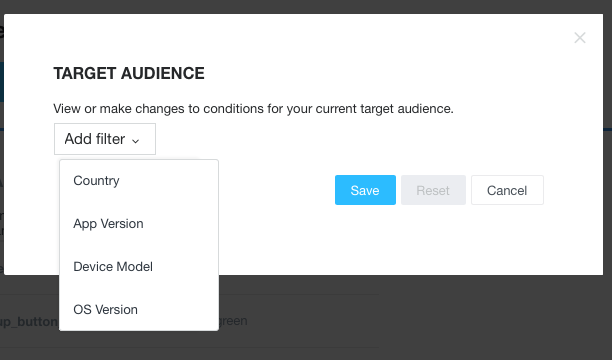 Parameter Group is defined on Flurry Remote Config UI. It is a grouping of Parameters and Variants. 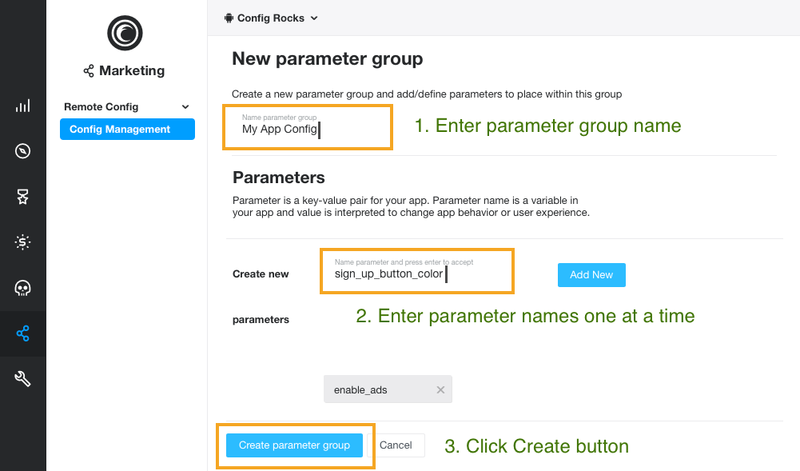 Allows Parameters and Variants related to a specific app experience to be configured together on Remote Config UI. You can setup multiple such groups per app. Parameter name (key) is defined on Flurry Remote Config UI. 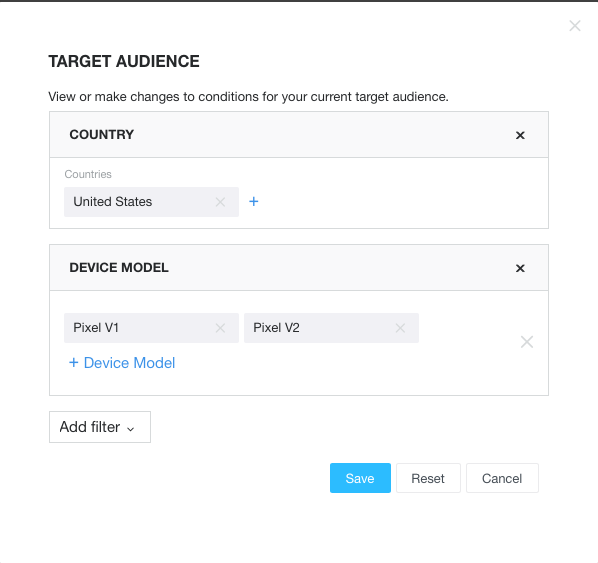 Parameter name is referenced in your app code to retrieve value provided by Flurry servers. You can have upto 300 Parameter names per app and each name can be 256 characters long. 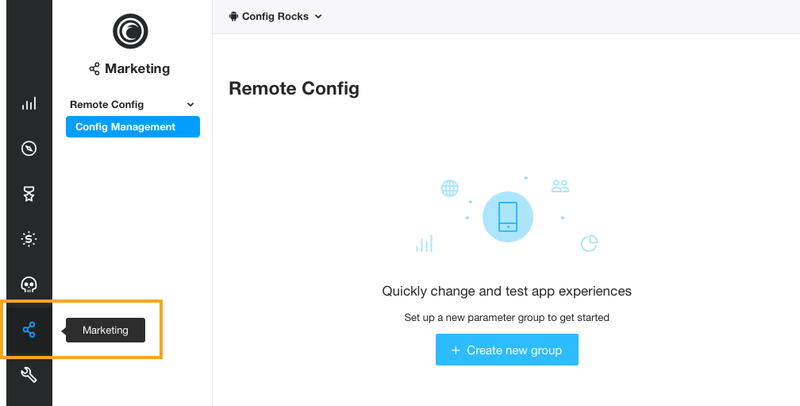 Parameter value is the specific value that you want to remotely send down to the app at run time. Each Parameter name can take one or more Parameter values on Remote Config UI (see Variants). Parameter values can be 2048 characters long. 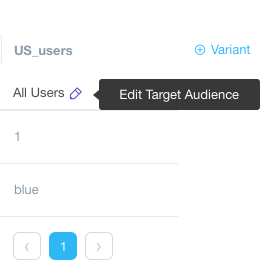 Variant is a combination of audience definition, values for each Parameter name in the Parameter Group and a Variant name to address this experience. Each Parameter Group can have upto 10 Variants. 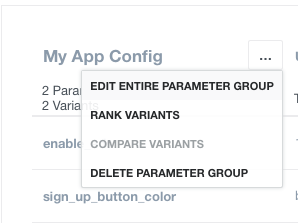 Rank is assigned to Variants for each Parameter Group. 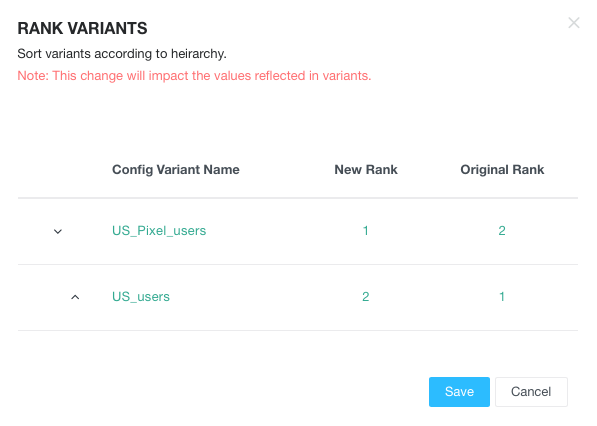 Variant rank determines priority order in Flurry server will match incoming request against Variants setup on Flurry Remote Config UI. Each Parameter Group has it’s own rank order. First Variant (column 2) is rank 1, second column is rank 2 and so on. 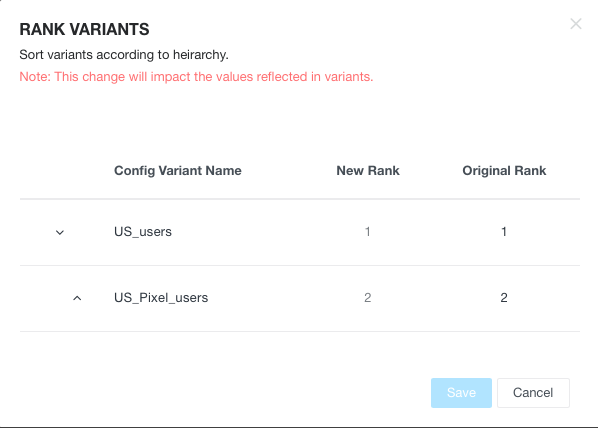 Put another way, in case user/ device matches multiple audience criteria for Variants, then the order in which you’ve ranked the Variants will determine which Parameter values are returned to that user/ device. Use left navigation bar to get to Remote Config UI. We call this the App Config management dashboard. If you don’t see it for your account, please email support@flurry.com, and we can help. Note: If you exit this mode without saving, then all changes are lost.